Cruiks, Howard, December 1st 2018, peacefully at Craigavon Area Hospital. Deeply regretted by his twin sister Helen, brother-in-law Raymond, niece Susan and partner Peter. Funeral Service to be held at Ravenhill Funeral Service, 334 Ravenhill Road, Belfast BT6 8GL on Wednesday 5th December at 11.00am. Funeral afterwards to Roselawn Cemetery. Family flowers only, please. 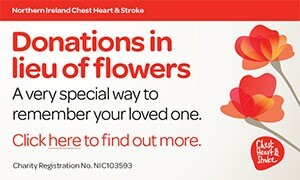 Donations in lieu, if desired, may be sent directly to Chest, Heart & Stroke N.I., 21 Dublin Road, Belfast BT2 7HB. Will be sadly missed by the wider family circle at home and in Australia. I am sorry to tell you that Howard Cruiks has passed away.